Developing a good palate for tea really requires keeping notes. Remembering what teas you do and don’t like needs notes, too, for most of us. And I’ve been searching for a tea journal that I really liked for a while. There are some pretty good ones out there, but I’m an individualist. I had to do my own thing. And my own thing is called A Tea Journey: Your Personal Tea Cupping Journal. 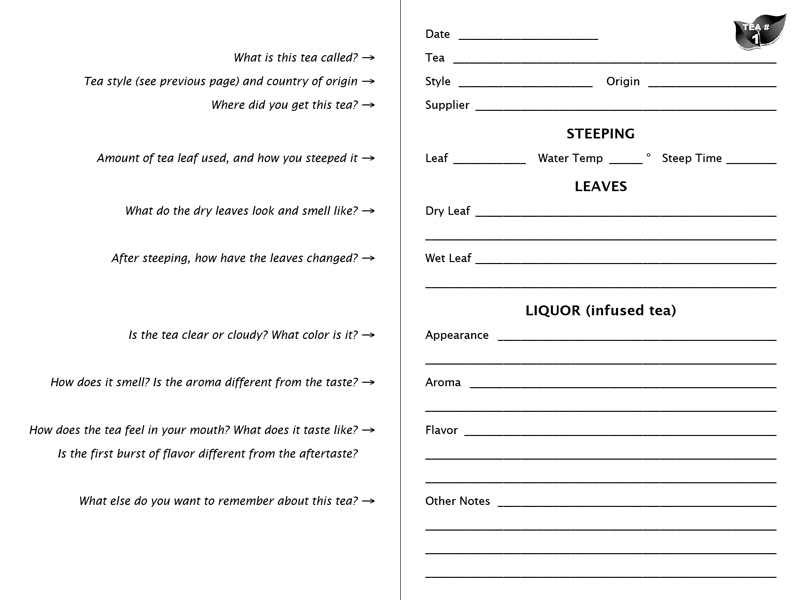 This guided journal is designed to guide you through the next 100 teas you taste. Keeping notes about each cup of tea encourages you to drink your tea actively, paying attention to taste, aroma, appearance, and how it feels in your mouth. When you journal about it, tea becomes an experience to savor and linger over instead of just another drink. Tea is a subjective experience. Between these covers, nobody’s opinion matters but your own. Don’t worry about what other people think of a particular tea; just record your own impressions. Each tea page is numbered, so you can see at a glance just how many teas you have tasted and written about. Some tea journals (especially the cupping journals intended for experts and aficionados) use terminology that may not be clear to a beginner. At the front of the journal, I included descriptions of the common tea styles and some related tisanes (rooibos, honeybush, yerba maté, and so forth). Also, on the page facing tea number one, I included short descriptions of what to write in each section. Comparative cupping is a great way to develop your palate. Get two similar teas and try them side by side, recording your impressions on facing pages of the journal. Obviously, the best possible Christmas present for a tea lover would be one of these journals and a big box of tea — and maybe a copy of Myths & Legends of Tea. Enjoy, and thank you for putting up with my utterly shameless self-promotion this week! While writing this blog post, I was enjoying a cup of Houjicha, a roasted Japanese tea about as different from traditional Matcha, Sencha or Gyokuro as you could possibly get. The roasting adds a nutty flavor and a toasty aroma that go beautifully with a cold, windy Montana day. Posted on 18 November 2015, in Styles & Blends, Tea Books and tagged cupping, hojicha, houjicha, Japanese tea, journaling, tea cupping, tea journal, tea tasting. Bookmark the permalink. 4 Comments. I had no idea you were working on something like this. I am a deep and mysterious man, Geoff! Great idea! I just launched (blatant self promotion also) my tea subscription box and I include my own tasting notes in each month’s shipment but I love your suggestion to add in their own cupping journal. Will yours be available soon? It is available now! You can get copies at any bookstore (just tell them it’s ISBN 9780965960960), or order directly from the publisher. There are quantity discounts.